As with all plants, grass needs sufficient nutrients to grow healthy. You especially need fertilizer when first establishing your lawn, because your grass must grow fast enough to establish strong root systems before weeds, pests and difficult weather conditions put strain on the grass. You must ensure that your grass gets adequate nitrogen, potassium and phosphorus. Since the soil takes some time to absorb the fertilizer, you should fertilize the lawn before planting the grass seed instead of afterward. 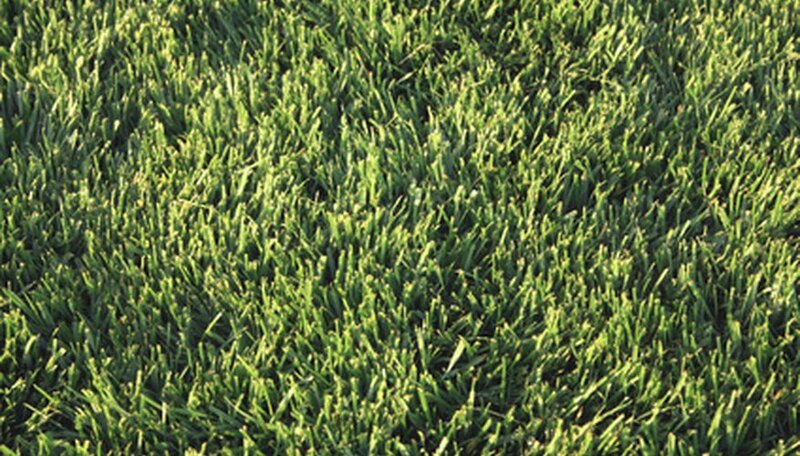 You can apply your grass seed as soon as you add fertilizer to your lawn. However, you must not use fertilizer that contains preemergent herbicides, or the grass seeds will not germinate. Before adding the fertilizer, you should till the soil. Soil tilling makes the soil looser so that water and fertilizer can pass through the soil. Tilling the soil also allows the grass to absorb nutrients, since plants need aerated soil to take water into their roots. Grass seed needs more phosphorus than most plants, since phosphorus helps the grass develop very deep root systems. Deep root systems ensure that the grass has sufficient access to water and nutrients and also prevents other plants, such as weeds, from sprouting nearby. You should use starter fertilizer and distribute the fertilizer at the rate suggested on the bag. Since these fertilizers are designed specifically for grass seed, you do not need to worry about measuring the quantity of each kind of fertilizer. You can add starter fertilizer four weeks after you initially seed the lawn to stimulate further growth. If your grass has dead patches, you must determine the cause of the dead patch before you add more seed, or else you will waste the grass seed. Nitrogen can kill grass seed in excessive quantities, so do not add nitrogen to the dead patches; excessive nitrogen might have been the original cause of the dead grass patch. Grass seed needs water to grow, but too much water will cause the fertilizer to leach out of the soil, which can reduce the soil fertility. You should thoroughly moisten the soil, but you should not saturate the soil. Some grass seeds come with fertilizer mixed in them. You should still fertilize the soil before applying the seed and fertilizer combination, but you may not want to add as much fertilizer, because the combined fertilizer of both applications can overwhelm the plants. When applying the seeds and fertilizer, do not use your hands. Instead, use a spreader, which can evenly distribute seeds and also minimize waste.